I have to announce that I am SO EXCITED to go to happy hour at Wasabi Bistro tonight with my friend Alysha. Right now I have visions of spicy tuna rolls and pork or chicken gyoza dancing in my head. Or rather, I can almost taste them. Haha. Speaking of Asian cuisine (not to be generalistic, though!! 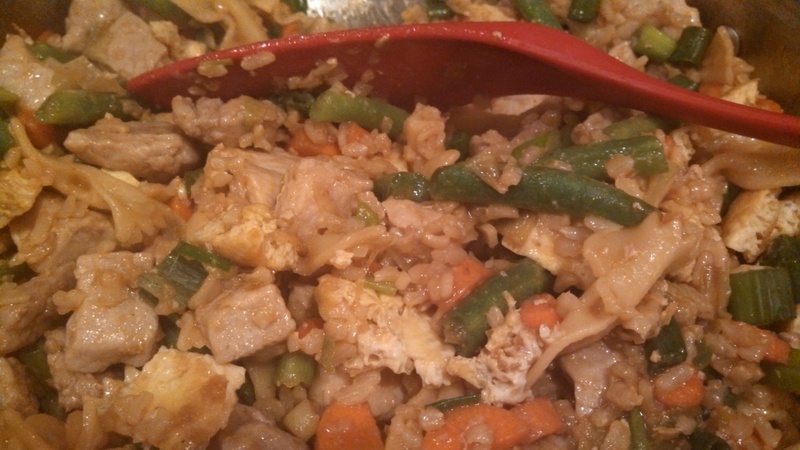 ), I made a delicious pork fried rice recipe last week, from Gimme Some Oven’s blog. 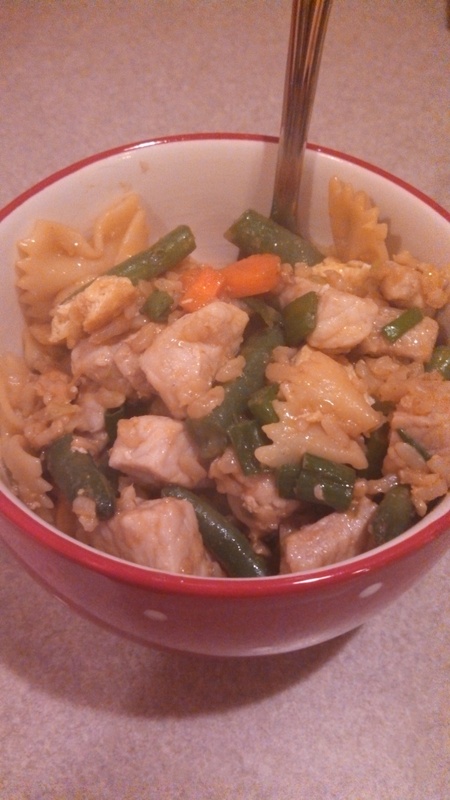 As with most things I’ve made lately, it was SO GOOD!! Though I will admit I had to be a bit innovative during the cooking process. It started when I realized we only had a small amount of leftover rice in the freezer, and as most of you know, it takes about 40 minutes to cook up a fresh batch of brown rice! Also, as some may know (I didn’t know this til more recently, to be honest), fried rice is actually much better with leftover rice (which can be either refrigerated or frozen). So my mom alerted me to leftover tupperware containers of frozen cooked spiral pasta in the freezer. My response, of course, was insisting that it would no longer be fried rice! 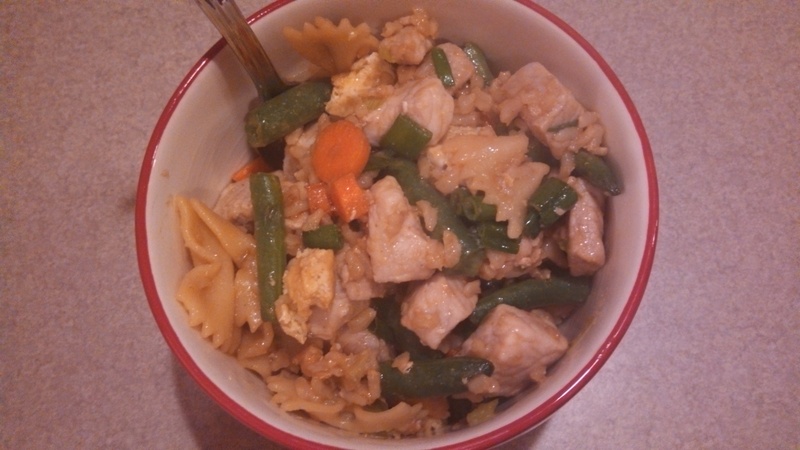 But she convinced me, and thus this pork fried rice and pasta dish was born. Also, I used pork chops, that I cut into very small pieces, instead of going out and buying Chinese sausages (though I’m not opposed to it, I just wanted to save money). Oh, and if you’re wondering, fish sauce is different from oyster sauce. The recipe called for oyster sauce and for some reason, I thought fish sauce would suffice, cuz, hey, it’s all seafood, right? Wrong. After putting in a teeny bit of fish sauce, I realized that was not, in fact, what I was going for, and subbed the rest of the oyster sauce for hoisin sauce, which I already had on hand. I know authentic Chinese chefs are probably shaking their heads in disgust at me. But when I see a non-Norwegian making lefse at Christmastime with flour instead of potatoes, it’ll be my turn to shake my head. 😉 😉 Oh, and if you don’t know what lefse is, you are truly missing out. Finally, I left out the optional ingredient of frozen peas and instead added fresh green beans, to increase the veg-factor. The best part about this dish might have been the egg. Cooking eggs mixed with sesame oil and soy sauce is probably most brilliant idea on the planet. It was all I could do to not eat the entire egg before adding it back to the stir fry. Seriously. -Beat the eggs with 1 tsp. light sauce and 1/2 tsp. sesame oil, and heat up a non-stick frying pan and add 1 tbsp. of oil. Pour in the eggs and swirl around to coat the bottom of the pan. Let the eggs cook flat, like a pancake. Flip once, then set aside on a plate and cut into small pieces. 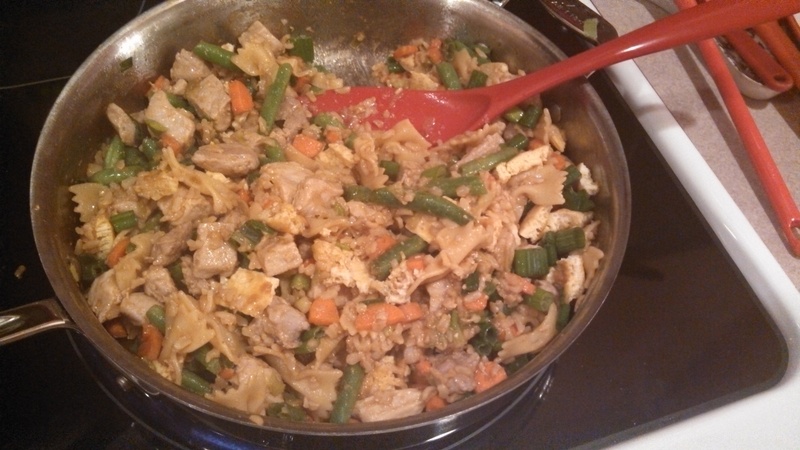 -Heat up a wok and add 2 tbsps. of oil. Add the garlic and fry for 3 minutes. Add the rice and 2 tsps. of light soy sauce. Fry on high heat for about 5 minutes or until the rice is hot and fragrant. Transfer to a bowl and set aside. -Wipe out the wok and heat again. Add 1 tbsp. of oil and the sausages and the whites of the spring onions. Stir fry for 2 minutes. Add the carrots (and peas), and oyster sauce. Stir fry for another 2 minutes. Put the rice back in and stir to mix. Stir fry for 3 minutes or until the mixture is hot. -Add the eggs and the greens of the spring onions. Stir for a minute then turn the heat off.